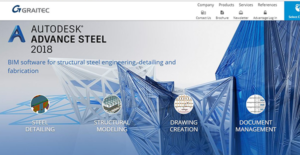 What is Autodesk Advanced Steel? Autodesk Advanced Steel is a comprehensive and easy-to-use BIM solutions suite designed by GRAITEC for structural steel engineering, fabrication, and detailing. It’s a reliable software that speeds up the workflows from design to fabrication with powerful 3D modeling tools that boost the accuracy of deliverables. The package is ideal for fabricators, architects, mechanical engineers, structural steel detailers, and engineers. This is an innovative industry-application that provides collaborative tools and enable users to gain interoperability flexibility to remain competitive in the structural steel global marketplace. The program is designed on the AutoCAD platform thus offering a familiar interface that expedites customizations and implementations while reducing the cost of training. Its key features include sheet & plate metal work, structural modeling, cold rolled steel, multi-user collaboration, document management, and automated drawing creation. Autodesk Advanced Steel is a powerful software with features that support fast and proficient modeling. The solution supports all the widely used CAD functions & concepts, and work well in 2D or 3D depending on the structure being modeled and user preferences. Its 3D model-based tools accelerate design and enable users to deliver accurate steel detailing with a wide range of structural element components and intelligent, parametric objects. The customizable automatic joints boost the efficiency and increase the speed of designing and modeling steel connections. Autodesk Advanced Steel integrates innovative technology that significantly accelerates and automates joint creation. In addition, the application adopts a reliable “Model Share” technology with inimitable work sharing tools. This, speeds projects and allows users across multiple geolocated offices to collaborate in real multi-user mode. Another notable feature is the automated drawing creation module. This package provides a spectrum of automated functions that enables users to create general arrangements and fabrication drawings with ease. It provides multiple templates and drawing layouts that can be customized to suit user’s preference with the drawing style manager. Autodesk Advanced Steel has a user-friendly document management module. This reliable feature centralizes the time-saving tools used to sort out details, check drawings, and print BOM. When your drawings are complete, you can easily create lists, bill of materials (BOM), and NC files. It allows you to choose from a list of custom or predefined formats including customizable sorting, insertion of logos, content definition, and more. The functionality puts you in control of changed elements and eliminates the risks that come with automatic updates of drawings. If you are considering Autodesk Advanced Steel it could also be sensible to analyze other subcategories of Best CAD Software gathered in our base of SaaS software reviews. Since each organization has specific business needs, it is advisable for them to refrain from seeking a one-size-fits-all perfect software application. Needless to say, it would be pointless to try to find such a system even among widely used software platforms. The smart thing to do would be to catalog the various vital factors that need consideration such as main features, budget, skill levels of employees, company size etc. Then, you should do your homework thoroughly. Read some Autodesk Advanced Steel reviews and investigate each of the other apps in your shortlist in detail. Such in-depth homework can make sure you reject ill-fitting systems and choose the solution that presents all the elements you require for business success. How Much Does Autodesk Advanced Steel Cost? Contact the vendor for their custom enterprise pricing information and other product details. We realize that when you make a decision to buy CAD Software it’s important not only to see how experts evaluate it in their reviews, but also to find out if the real people and companies that buy it are actually satisfied with the product. That’s why we’ve created our behavior-based Customer Satisfaction Algorithm™ that gathers customer reviews, comments and Autodesk Advanced Steel reviews across a wide range of social media sites. The data is then presented in an easy to digest form showing how many people had positive and negative experience with Autodesk Advanced Steel. With that information at hand you should be equipped to make an informed buying decision that you won’t regret. What are Autodesk Advanced Steel pricing details? What integrations are available for Autodesk Advanced Steel?